Quick and Best Website Design in Affordable Price! It has been only few weeks since we launched our new WordPress Web Designing and E-Commerce Web Design Plans with 50% discount offer and the feedback we’ve gotten from you, the users, and the industry, has been fantastic. Charges for upload and resize images are 100Rs for each image. Charges for image customization i.e collage, shading, re-touching, etc are 5000Rs for each image. The packages contain the cost of homepage designing, If any customer demands the customization in the inner pages layout an additional invoice will get triggered. 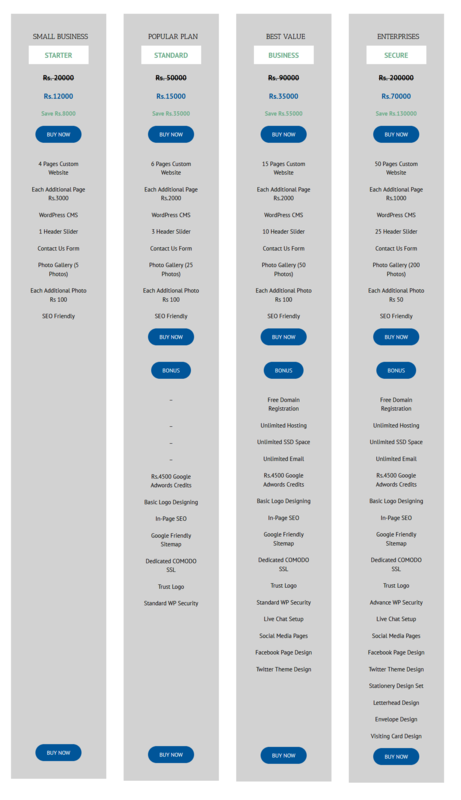 Each additional customization in the layout of inner pages will cost 5000Rs. The original multi-purpose demo that showcasesmost of our features & layouts. Anything seen here can be used on any other demo. Rich and sophisticated, yet still down to earth. Pakish Cafe is best and absolutely stunning and and makes you want a yummy food. A beautifully clean Travel demo with stunning imagery and a clear message. Pakish Travel will hit. Pakish Fashion is sleek and modern with a stylish edge that you may not of thought possible with Pakish. Pakish Law is a new demo geared towards Lawyers. It has very clean lines and crisp colors for a professional look. Pakish Technology is a new demo geared towards technological servcies. It sports a trendy flat design with large layout sections. Pakish Architecture is a new demo geared towards architecture. Modern design with sharp lines and crisp layouts complete this unique demo. Pakish Hotel is a beautiful high end demo geared toward the hotel industry. Side header layout with beautiful layout sections for images. Pakish Lifestyle is a new demo geared towards health, fitness and well being. Side header layout with large layouts & attractive call to actions. Beautifully clean and modern design for the lovely couple about to make the most important commitment of their lives. Pakish Charity is perfect for any organization looking for a professional online presence to help push their passion for a better world. Pakish Health is a perfect fit for any type of medical industry that has an easy to adapt design for the specific medical specialty you need it for. This beautiful demo is perfect for Churches & Non-Profit’s. Features full design integration for The Events Calendar plugin. Hipster design with side header for any creative professional looking to create the perfect site to show off their skills. Pakish Creative stands out from the typical creative agency. It’s modern & clean design style with crisp typography & large imagery is beautiful. The Construction industry is booming & highly requested. Pakish Construction provides a professional, unique and worthy design. This is a beautiful modern demo with a minimalistic fly out header for menu and search. Perfect way to showcase your photographs. Pakish Science is modern along with a focus on typography, imagery and content that make it a perfect fit for the science or medical industry. Pakish Freelancer is beautiful & stylish, allowing you to creatively show off your hard working skills to potential clients. Information Technology is a huge part of our life. Pakish IT showcases cutting edge design and is adaptable for many uses. Clean, modern and fresh. Pakish Finance is designed with flexibility and can be adapted to any business website. Pakish University is brilliantly assembled and very versatile. Course outline pages, Events Calendar integration and more. This beautiful tech forum demo is perfect for bloggers and for community forums. Features full design integration for bbPress. Pakish Hosting is a new demo geared towards web hosting servcies. It sports a trendy flat design with large layout sections. Pakish Promote is a general promotion demo with a modern design that has big bold text, beautiful images and clean crisp layouts. This demo uses an awesome Layer Slider with our 100% height full scrolling sections which really capture the viewers eye. Pakish Electrician is sleek and modern with a stylish edge that you may not of thought possible with Pakish. This is a beautiful demo for all beer lover and production company around the globe. Perfect way to showcase variety of beer and their events.